• The ability to program and achieve precise cycle parameters, including main ram, knockout cylinder and draw-cushion force and position. Meggitt Safety Systems’ new 500-ton hydraulic press features several performance-enhancing features compared to its previous 1963-vintage hydraulic press. Shown are deep-drawn components for a fire-suppression bottle (far right) used for aircraft-engine extinguishing. • Recipe functionality, to create and store proven recipes and avoid relying excessively on the skill of individual operators. With its aging press, each time a new tool was loaded operators had to manually make adjustments, identified as a potential source of process variations. • Increased energy efficiency and machine safety. Meggitt found a solution with Beckwood Press Co., St. Louis, MO, which provided a custom 500-ton, 36- by 36-in. draw press featuring 56 in. of daylight, 40-in.-stroke cylinders and a programmable bed cushion. The cushion offers dynamic control through four different travel zones. And, through the press’s human-machine interface (HMI), the manufacturing engineer can specify the desired cushion force for a desired amount of cushion travel. Meggitt’s new made-to-order hydraulic press plays a critical role in the company’s manufacturing process, so reliability is paramount. Therefore, Beckwood included several reliability-focused features well-accepted by Krochmal and the rest of the Meggitt manufacturing team. For example, Meggitt’s press includes an onboard press-health monitoring system (Beckwood dubs it Heartbeat). The setup actively monitors the hydraulic fluid in the press to help ensure optimum operating efficiency. The ability to continuously monitor fluid health against acceptable fluid standards limits or eliminates a major cause of unplanned hydraulic-press downtime: contaminated oil. Using the Heartbeat system, the press HMI displays actual measured ISO codes, the channel size (µ) and the system’s moisture-sensor reading (percent relative humidity) related to the hydraulic fluid inside the system. Also displayed are limits to these variables, as defined by Meggitt engineers. When these limits are surpassed, the Heartbeat sensors trigger warning indicators, also displayed on the press HMI. This notice, in advance of any component failure or decreased press performance due to contaminated oil, allows Meggitt’s maintenance team to schedule necessary maintenance, such as replacing standard filter elements, in a timely manner. This avoids any unexpected component failure and downtime due to unchecked contamination. Meggitt’s press also is equipped with a WebPort Communication Module, allowing Beckwood engineers and service technicians to remotely log in to perform factory diagnostic support and troubleshooting. Through the WebPort, program updates also can be remotely uploaded, notes Beckwood engineering manager Darrell Harrelson. For additional reliability, the hydraulic circuit of the press was simplified by offering separate individual circuits for the main ram, bed cushion and knockout cylinder. Each has its own dedicated pump and motor combination, easing troubleshooting and allowing Meggitt’s maintenance personnel to more quickly zero-in on any potential issues which might arise. Another item on Meggitt’s wish list, increased energy efficiency, came to fruition thanks to the inclusion of a unique variable-frequency drive (VFD) system, supplied by Parker Hannifin. In a traditional hydraulic press, the ram is powered by a hydraulic cylinder pressurized by a pump or hydraulic power unit, and the hydraulic pump runs at full speed throughout the entire process—approach, pressing and retract. Output is regulated by valves. Meggitt’s 500-ton draw press employs a VFD-controlled pump. 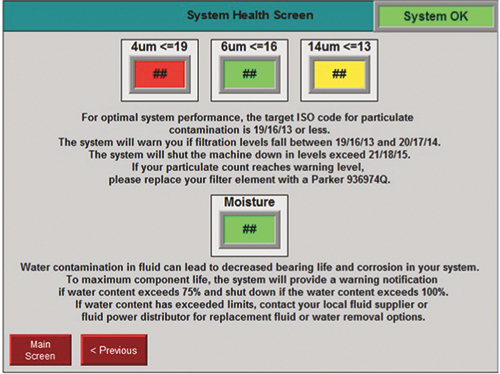 This screenshot of the press’s fluid-health system helps operators understand how fluid contamination can impact press performance. The system provides warnings if fluid health declines past a defined point. Energy savings are verified by examining the press’s power usage over several operating cycles. By lowering the speed of the pump, less power is consumed versus traditional methods of hydraulic speed control. “And, by lowering energy cost, the effective cost of each drawn part drops proportionally,” confirms Krochmal. Finally, when only the power needed to perform the work is expended, the pressure drop throughout the entire hydraulic system is minimized, in turn reducing the cooling requirements needed to keep the press at optimal operating temperature. 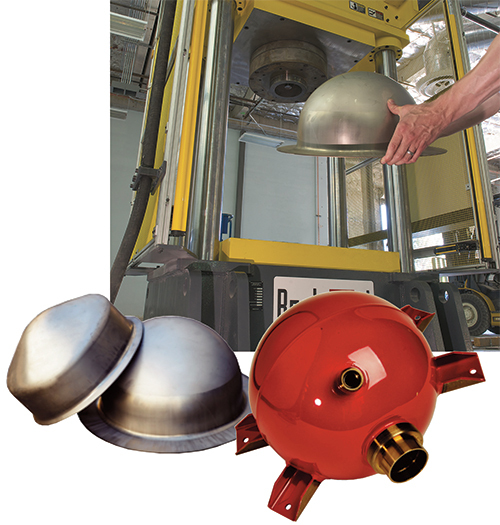 Meggitt’s operators also benefit from a dramatic reduction in audible press noise, since pump speed is reduced for much of each press cycle. And, in addition to the pre-preventive maintenance features described above, a dramatic reduction in system pressure, facilitated by the drive, contributes to greatly extended component life. Last but not least, Beckwood outfitted the 500-ton press with a variety of redundant safeguards. As standard, the multiple-cylinder configuration includes redundant solenoids to control hazardous ram motion. Parker safety couplers provide hydraulic cylinder-to-ram attachment. In addition to the baseline offerings, a ram safety catcher system (RSCS) provides secondary load holding of the ram at any position throughout the stroke. The RSCS is powered to the open position, allowing free travel of the ram in either direction. Upon a sudden loss of power, the ‘held-open’ RSCS immediately closes, preventing further movement of the ram at any point in the stroke. The RSCS is managed by a Jokab Safety PLC, which monitors the performance of all safety valves, in addition to the RSCS. And for perimeter guarding, light curtains protect the front and rear openings of the press and expanded metal guards protect side openings. Article provided by Beckwood Press Co.: 636/343-4100; www.beckwoodpress.com.